From transforming cities to nurturing grapes, serendipity describes the LDV Winery evolution. As professional community and strategic planners, LDV owners Peggy Fiandaca and Curt Dunham made a career assisting clients in creating successful plans. A strong game plan is vital in any industry, but more importantly, success results from responding to possibilities. That life journey of possibilities is what led Fiandaca and Dunham to develop a vineyard in southeastern Arizona that is now producing distinctive, hand-crafted wines. Fiandaca and Dunham, long-time wine collectors, have found the magic of the “grape to glass” journey intriguing. From wine collecting and thinking about retiring, to finding the perfect land in Arizona’s Chiricahua Mountains our vineyard/winemaking adventure began in the most serendipitous way. My love of wine is traced back to a bottle of 1974 Beulieu Vineyards George Latour Private Reserve Cabernet Sauvignon brought home by my parents from a trip to Napa Valley. I couldn’t believe a grape could taste like blackberries, cherries, coffee, and chocolate. Learning to cook and visiting wine regions all over the world expanded my interest and insight to winemaking. These visits were not the typical tourist visits but appointments with winemakers at small wineries focused on learning the entire process; never dreaming I would someday be making it myself - with my name on the bottle! As I learn more about the grapes that are being produced from our mountain vineyard location, I am excited about the possibilities with every day presenting a new challenge. My goal is to ensure that every vintage is respected as the once in a lifetime occurrence it is with the resulting wines reflecting truly exceptional place-based wines. Wine is a character actor in every Italian family. The Fiandaca family emigrated from Sicily to a Chicago Italian neighborhood. My mom’s father, William Hogan was a well-known bootlegger in Kentucky during Prohibition. With this kind of heritage, my urban planning career was a side step on the road to growing grapes and producing wines. Every day brings a new experience in the vineyard or winery where my creativity, knowledge, and patience are challenged. Watching someone taste wine and identify the flavor characteristics for the first time or examine a vine closely with a new appreciation for its role in producing that wine, provides me with great satisfaction. That connection to the land, our environment, and to each other is what our winemaking journey is all about. LDV Winery emerged from an undeniable connection to the land and an opportunity to make wines that showcased from where the grapes were grown. None of this would have been possible without finding the perfect spot to grow world class wine grapes. Five key locational factors needed to be satisfied on one location. The vineyard site needed to be at a high enough altitude to create a 30-degree temperature differential between the daytime high and nighttime low. Also, a large mountain was needed to impact the local microclimate. 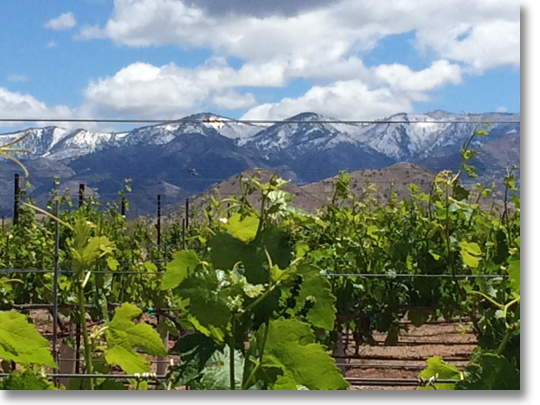 The vineyard location at 5,000 feet above sea level with the 10,000-foot peaks of the Chiricahua Mountains soaring behind the vineyard did the trick. The vineyard sets atop the Willcox Playa aquifer which supplies reliable, pure water to sustain the vines. The site needed to drain away summer rains and move cold air past the vineyard in the spring. The site lies along the banks of the 600-foot wide Ash Creek which serves as a drainageway for water and air. The vineyard is also planted in very rocky soil which helps quickly drain away moisture. The violence and heat of volcanic activity creates soils that impart pleasurable and unpredictable characteristics to wine grapes. The LDV Vineyard is in the blast zone of the Turkey Creek Caldera eruption that occurred approximately 16 million years ago. The Vineyard site had to be pristine where nothing had been grown on the property in the last 100 years and no production agriculture nearby. The volcanic and granite soils are perfect for fine wine grape growing and the area is clear of any pesticide drift from other agriculture. LDV’s philosophy is embodied in the winery’s logo and exemplifies the inseparable relationship between farming and winemaking. The property has supported people for hundreds of years based on the regional history and geology, as well as the artifacts found in Ash Creek that cuts through LDV Winery’s 40-acres. The first circle honors the original farmers - the Native Americans who grew corn and squash along Ash Creek. The second circle represents LDV, the next generation of farmers growing wine grapes. The third circle represents LDV turning the grapes into wine. We strive to ensure that “earth’s fruits come full circle.” LDV’s philosophy is focused on being good land stewards and ensuring that the next generation will continue this quality farming legacy.